I wrote the entire 100 pages of this life-changing book in 2 days under the influence of the Holy Spirit, days after I became a pastor. I did not step out for those two days, the inspiration was strong. This is not a Motivational book that will just tell you that 'you can do it'. Rather it's a practical success book for anyone who wants to become truly successful without messing up. You will see what to do in today's fast-changing world and How To Do It to be successful. Get yours! The delivery is FREE to anywhere you are in Nigeria. 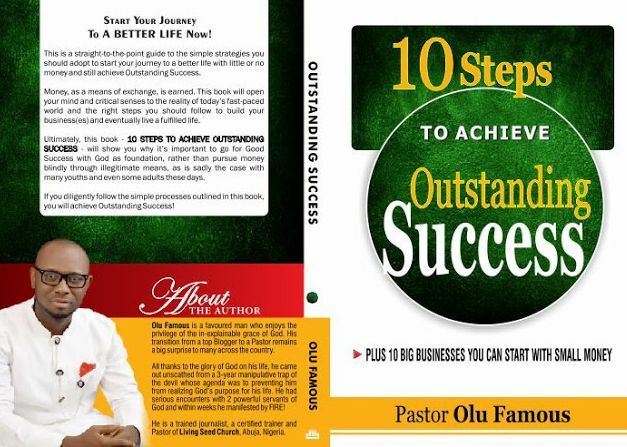 Also, the e-version of my book - 10 Steps To Achieve Outstanding Success - is now available on all top online stores in the world, including Amazon, Apple iBooks, Banes & Nobles, etc.